I’m looking at the scoreboard here, and it appears the Phillies have defeated the Colorado Rockies 5-4 on a walk-off single by Domonic Brown. This, after they looked dead in the water with two outs and nobody on in the ninth. Somehow, someway, the Phils have won a series. It’s the just the second time that’s happened since the All Star break, the first win coming against the hapless Cubs. The Philles have now won four of their last five games, three by walk-off. – The Phils would get the tying run in scoring position in the ninth on a two-out double by Jimmy Rollins. With Young at the plate, Rollins was able to steal third, and put himself 90 feet away from knotting the game at 4. With two outs, the extra base didn’t seem like it would matter much. That is, until Young hit a little dribbler past the mound on the left side. A swinging bunt, the Rockies would have no play on Young at first and Rollins would score. It was fluky, but Young atoned for failing to come through earlier in the game. Chase Utley would follow the single with a walk, and suddenly the Phillies had a shot. Up to the plate strolled Brown. 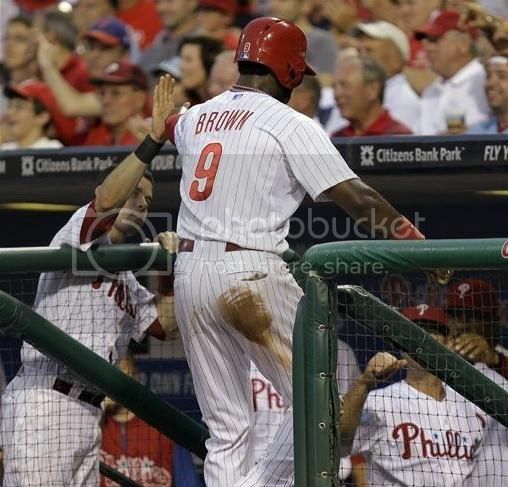 – Brown has been the Phil’s best offensive player this season, so it’s fitting his seeing-eye single through the right side would win it for the Phils. The hit was Brown’s second on the night. – The Phillies first run came when rookie Cody Asche drove in Brown with a double in the second inning. Rockies pitching dominated the Phils for five innings after that, holding them without a run or even an extra base hit. The Phillies did threaten a couple times, even getting runners on first and third to bring the tying run to the plate with two outs in the seventh. But Michael Young grounded out weakly to second on the first pitch he saw. – In the eighth, the Phillies found a little life thanks to a lightning strike by Darin Ruf. His two-run dinger pulled the Phils to within a run and broke a long streak of lifelessness. After tonight’s game, Ruf is now OPSing .890 on the season. He’s also been serviceable in right field, hardly getting exposed like a lot of people (myself included) thought he would. Small sample size, sure. But Ruf has been a pleasure to watch since getting called up. His home run would make a difference tonight. – Like just about everything having to do with the Phillies, things have been pretty dreadful for Kyle Kendrick since the second half started. His 7.20 ERA only begins to tell the story of how bad it’s been. Facing a formidable Rockies lineup, Kendrick stood no chance. – He navigated the first four innings without incident, but he’d allow four runs over the fifth and sixth innings combined, the big blow coming on a three-run home run off the bat of Wilin Rosario. On the pitch, Kendrick raised his hands in disbelief, seemingly baffled by his own inability to get hitters out. He looks lost out there. This is a version of Kendrick we haven’t seen in quite some time. – Despite having thrown only 78 pitches, Sandberg opted to pull the plug on the maligned Kendrick shortly after the homer. He’d exit the game unable to record an out in the sixth, four runs and eight hits to his name, with only two strikeouts recorded. At the very least, you have to marvel Kendrick’s consistency since the break. – Hey, it’s not all bad in Phillies land, alright? That’s two walk-off wins in a row. To boot, over the last 10 games the Phillies bullpen has pitched pretty well. Tonight they didn’t allow a single run over four innings. Maybe some of the kids are starting to figure it out? -The Phillies kick off a three game set with the Arizona Diamondbacks this weekend. Cole Hamels (5-13, 3.61) takes the hill against Wade Miley (9-8, 3.56).